A book featuring a brown-skinned princess? Yes, please! Meet my new friend Kelly Greenawalt author of Princess Truly and The Hungry Bunny Problem! I am the freckle-faced momma of four amazing black children. I grew up in a large Irish Catholic family in New York City. My parents divorced when I was teenager and I moved to a small town just outside of Houston with my mother. I fell in love with sweet tea, bluebonnets and my amazing husband, Chuck. This year we'll celebrate our 16th wedding anniversary. Together we've adopted four children - Clay, Travis, Calista and Kaia - and fostered many more. My hobbies include wrangling four children, laughing until I can't breath, yacking on the phone with silly sisters, staying in my pajamas as much as possible, fiddling around in my garden and writing. Princess Truly is a clever little girl with magical curly hair that is especially good at solving problems. In this story she helps her friend, Lola Little, grow carrots for her hungry bunny friends. It's an enchanting tale that inspires little girls to learn, to be helpful, to love their curly hair and to use their imaginations. I wrote Princess Truly and The Hungry Bunny Problem for my daughter, Kaia. After watching her favorite Disney movie for the hundredth time, my daughter announced that her hair wasn't special or beautiful. 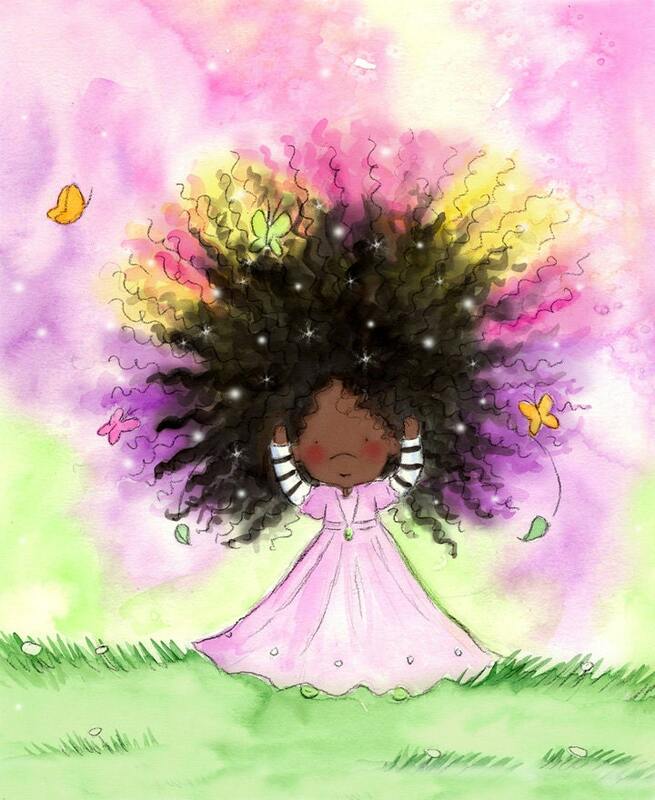 She'd never seen a black princess with natural hair and so she decided her gorgeous curls were ugly. I was shocked... heartbroken. I set out to find a character she could identify with and came back empty handed. In repsonse to the lack of such a character, I created one. Princess Truly was born. When the story was finished, I shared it with a few close friends and family members. They encourage me to publish the book. I am working on a second Princess Truly book. I'm also doing lots of laundry, driving my four children to various activities and trying to potty train our new puppy, Jonas. I lead a very exciting life. Entry period: July 1-July 5 at noon (Central Time). Prize: A copy of Princess Truly and the Hungry Bunny Problem. 1: "Like" Kelly's FB page, and leave me a comment telling me you did so! 2: Visit the book's illustrator's Etsy shop, browse her items, and leave a comment on this post telling me which one you like the most! 3: Share this giveaway on FB or Twitter, and leave a comment telling me you did so. 4: "Like" my book's FB page, and leave me a comment letting me know you did. 5: "Like" my blog's FB page, and leave me a comment letting me know you did. 6: "Like" my t-shirt business' FB page (we specialize in creating cozy shirts celebrating adoption, special needs, and people of color), and let me know you did. 7: Share any of the FB pages (see #4, #5, and #6) on your FB page, and leave a comment letting me know you did. BEST WISHES! I'll post the winner after the holiday weekend! I liked your t-shirt Facebook page. I "Liked" your book's FB page. I "liked" your blog's FB page. I "liked" your T-shirt business's FB page. I liked Kelly's facebook page. I "liked" Kelly's facebook page. I liked your t-shirt business' page! I liked your books facebook page. This is my favorite print. May need to be making an appearance on my daughter's walls.